John Piper is founder and teacher of desiringGod.org; he is the author of more than 50 books and travels regularly to preach and teach. New messages are posted to this podcast as they become available. 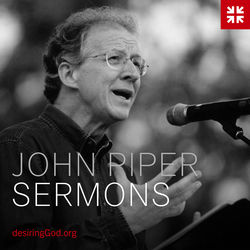 Piper’s sermons, books, articles, and more are available free of charge at desiringGod.org. We want people everywhere to understand and embrace the truth that God is most glorified in us when we are most satisfied in him. Listen and subscribe now to the best Christian podcasts today from podcasters just like John Piper - Desiring God. These popular Christian podcasts are available to listen to and download for free on Faithplay. Faithplay is filled with more episodes from John Piper - Desiring God and other top Christian podcasts. Download Faithplay today and start listening!